At Liquid Latex Fashions.com you will find the only Ammonia-Free Liquid Latex Body Paint. Our special formulation includes FDA approved ingredients that is safe for use on the face and body. 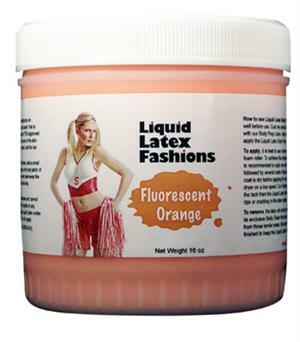 One of the most remarkable things about Liquid Latex Fashions Latex Body Paint is that it dries at room temperature and forms a highly elastic rubber. Liquid Latex is not made as a permanent coating on surfaces. It will lift off the skin by itself after several hours of wear. It will not clog the pores nor prevent perspiration from forming. Liquid Latex is permanent on fabrics and clothing. Click here to view the Liquid Latex Fashions sample color charts. * Note: For the Fluorescent colors we highly suggest using 2 coats of our Basecoat Foundation prior to applying the Fluorescent color. This will allow for easier application of the Fluorescent Liquid Latex Body Paint and provide a more vibrant color with fewer coats.